This year an exciting and diverse range of projects engaged with the extensive holdings in the Design Archives relating to the Festival of Britain. These include 77 files and over 400 photographs in the Design Council Archive dealing with the design of the various pavilions on the South Bank, papers and photographs in the F H K Henrion Archive documenting the displays for which Henrion was responsible, and likewise, in the Willy de Majo Archive, some rare material associated with the Festival presence in Northern Ireland. Brief descriptions of all 77 Festival of Britain files in the Design Council Archive are now among the Design Archives listings accessible on the Archives Hub, a portal to descriptions of archives held in universities. In addition, the JISC-funded Look Here! Project enabled the digitization of one of the key files in this series, relating to the Homes and Gardens Pavilion. Each page was scanned so the entire file can now be accessed online. Items relating to the design of signage and type for the Festival were included in an exhibition ‘Museum of ‘51’ at the Festival Hall for which Design Archives Fellow Dr Harriet Atkinson acted as consultant. Harriet also convened a public seminar on the Festival which attracted a large audience and brought together many designers who were involved in the Festival displays. As part of Archives Awareness Week at the Victoria & Albert Museum on Saturday 3rd September 2011 Harriet gave a keynote talk: ‘“A Constellation of Events”, the nationwide exhibitions of the Festival of Britain’ to around 40 attendees. Harriet’s book ‘The Festival of Britain: a Land and its People’ - which includes many photographs from the Design Archives - will be published early in 2012. See also ‘Archaeology and the Festival of Britain’, British Archaeology, (October 2011). On Sunday 26 June, Professor Jonathan Woodham and Harriet Atkinson took part in a Radio 3 programme about the Festival with Sir John Tusa. Various photographs from the Design Archives were included in a book on The Lion and The Unicorn Pavilion by Henrietta Goodden and the accompanying exhibition at the Royal College of Art. A feature in the quarterly magazine of the Hereford Civic Society included a photograph of the Skylon from the Design Archives. The Skylon was fabricated in the Hereford works of Messrs Painter Bros.
Design Archives resources on the Festival have continued to provide stimuli to a range of under- and postgraduates drawn to various aspects of the Festival as a dissertation subject. 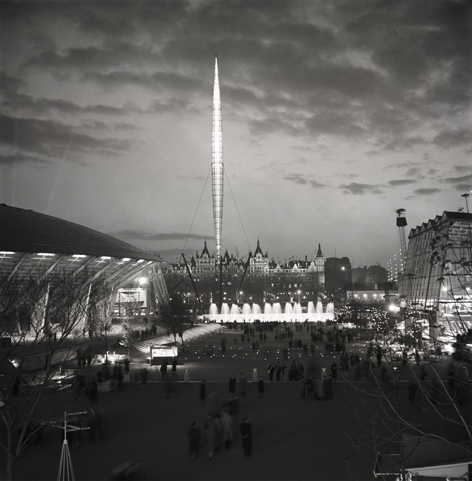 Image: South Bank Exhibition, Festival of Britain 1951. View of Skylon with pedestrians at dusk. Dome of Discovery on the left. Reference number GB-1837-DES-DCA-30-1-FOB-DD-20.